Whizz things up in the kitchen with a food mixer. 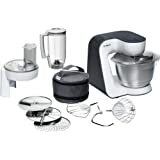 Electric shopping offer a great range of food processors and electric mixers from top brands for you to choose from. Brands stocked include Moulinex, Magimix, Kenwood and Cuisinart.